These were just a few of the frequent complaints about the human resources and business processes of the South Orange County Community College District (SOCCCD) and its two colleges: Saddleback College, Mission Viejo, and Irvine Valley College, Irvine, Calif.
We had two different systems for HR and finance—one of which was 26 years old—and neither was capable of keeping up with the volume and complexity of serving 44,000 students and more than 3,200 employees. Streamlining byzantine and lengthy processes emerged as a goal in strategic planning sessions, leading us to change the way we do business. After forming a small steering committee in 2013, we began with the concept that technology itself cannot solve process problems. Partnering with Strata Information Group, we held more than 20 business process analysis (BPA) sessions over the course of a year, each concentrating on a key area such as hiring, budget development, travel, purchasing, and financial aid. We invited faculty, staff, and administrators to share their thoughts, with groups ranging from 20 to 70 participants. Each interactive session lasted two days, with the first day devoted to mapping out the current process from A to Z: what worked, what didn’t work (and why), and what workarounds people had devised. On the second day, we talked openly about the ideal process—how it would work in a perfect world. The sessions built consensus, communicated objectives, and cultivated excitement and momentum for a successful project implementation, which was unusual to see in an administrative systems project. In addition to developing an RFP based on our ideal processes, we created a Business Process Innovation Checklist. The one-page, 10-point checklist summarized goals such as simplification (Have we shortened the time from start to finish?) and going paperless (Have we eliminated “wet” signatures, forms, and folders?). We referred to this checklist consistently during the design and rollout of the system to keep team members focused on the project’s over-arching goals and purpose. Our ideal processes also served as the basis for the “script” we gave the three RFP finalists. Each vendor was given four days to demonstrate how to use its system to accomplish specific activities, such as hiring a new employee, developing a budget, and making a purchase. We wanted to see how each system would work compared to the ideal practices we’d identified. 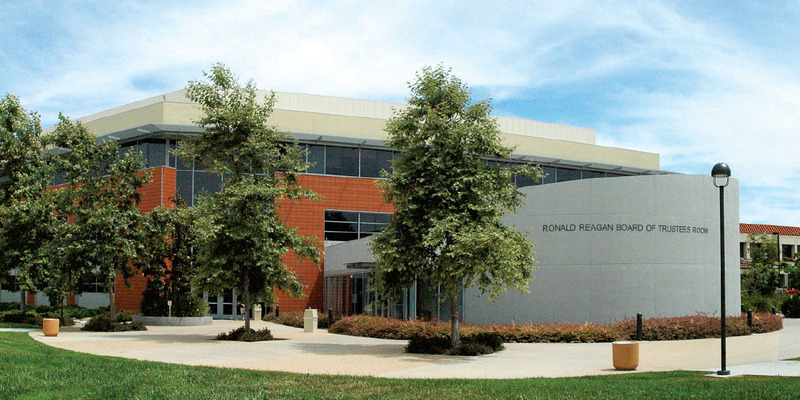 California’s South Orange County Community College District encompasses two campuses—Saddleback College in Mission Viejo (above), which houses the district services offices, and Irvine Valley College in Irvine. Previously, the HR department had used more than 230 forms. We eliminated all of them. In some cases, the hiring process required more than 90 steps; now, it takes fewer than a dozen. Shadow systems are no longer needed; data are entered once, with systemwide access. The system automatically sends a request to the appropriate individual for approval, speeding up that process. As information is entered, the system updates instantaneously. For example, we can generate an up-to-the-minute organizational chart every time someone starts, gets promoted, or separates. Major ERP implementations, at their core, are not technology projects; they are change projects. For SOCCCD, using business process analysis, from procurement through implementation, ensured that our ERP vendor effectively implemented the changes we desired. SUBMITTED BY Debra L. Fitzsimons, vice chancellor business services, South Orange County Community College District, Mission Viejo, Calif.